The Mental Health Pharma-conspiracy How good is your eyesight? People sometimes jump to conclusions, skipping over potential explanation in favor of the explanations they most desire. If you think you have Morgellon, did you actually check that none of the things listed here could be responsible for your symptoms? Here’s something that might be responsible for a fraction of the Morgellons cases. come on……we have been through all that and more. When a doc labels you dop without looking at anything. You are stuck. We have been given lice stuff to use, scabie, mite stuff, does not help. It is not this stuff. We know what these are and they do not have fibers. FIBERS is the word. You know,those polymer things that carry bacteria. If something has been genetically altered and protists are involved, then we have a problem. Something has been genetically altered. Do you mean that doctors prescribed “lice stuff to use, scabie, mite stuff”, to your family, or are you speaking on behalf of all who think they have this illness? If you read the article, you’ll see there are several mentions of fibers. Have you considered those? Can you back up any of your extraordinary claims with evidence? What I’m saying here is that there are whole bunch of reasonable explanations for your itching (and even your fibers). It just seem that these explanations are discounted for no good reason, in favor of more esoteric explanations. Occam’s razor dictates we look at the simpler explanations first, and provide firm evidence why it is NOT a more pedestrian cause. There are many diseases in this world. Some are common, and others are not. But there is no Morgellons Disease, by any of its names. The disease does not exist. So, if Morgellons is not a disease, what is it? In other words, what are these people suffering from? Here’s a few common skin disorders. Study their symptoms. Look at the pictures and compare. Please remember that you may have more than one disorder and that a compromised immune system can do some very strange things. Everything that is breathed, ingested, and absorbed, will be metabolized, encysted, or expelled in one way or another. In many cases those materials are pushed toward the epidermal surface. Many Morgellons sufferers have common skin problems. Some may have parasitic infections. Others, no doubt, are delusional. The belief that Morgellons is a mystery disease, caused by a novel organism, is a delusion. The search for such an organism can become an all consuming obcession. At that point Morgellons becomes a curse. Don’t be insistent upon finding a disease that produces fibers. There’s many possible sources of fibers. Some are industrial. Others are fungal. Hundreds of fibers are inhaled with every breath of air, and many are injested are absorbed into the skin. Vague terms like “stuff”, “things”, “you know”, then relating it to an intense knowledge of physics (are you confusing that with… biology?) and ending with “something” has been genetically altered.” Good moves! Something HAS been genetically altered. And it has nothing to do with you, sweetie. With eloquence like that, anonymous, how can we NOT believe you? Just out of curiousity, can anyone else see a face in that scabies mite picture at the top of the page. I see 2 eyes, a mouth and a nose. Check it out see what you think. You may need to borrow my “rose coloured glasses”..
P.S. 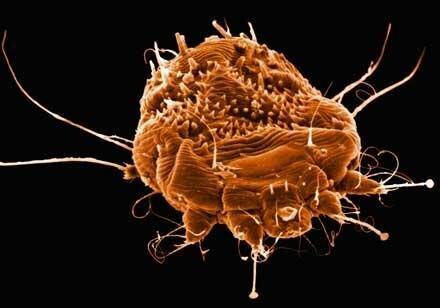 that scabies mite looks like he’s growing hair too! I best go sleep off my delusions, bye. That’s Pareidolia, which is unrelated to paranoia. Everyone has pareidolia. So true Michael, because up until recently I never noticed that the Moon has a face. You have a look next time there is a full moon, you will see the face. This webpage is being paid for by “the people” who are spreading “this disease”? With specifics like that, surely you are not espousing a conspiracy theory. You may see an eyes, a nose, and a mouth, because that’s what human eyes do. It’s common to see face-like structures even in something as simple as an electrical plug– look at yours now, see? Two eyes and a mouth? Also, Japanese people generally see a rabbit in the moon, not a face. Look for that next time you’re stargazing. Sarah – Unfortunately,it is a conspiracy. Sarah if anyone was trying to give us a sign – it’s either the great creator himself or Aliens really do exist. Also before anyone gets any weird ideas – I’d much rather reframe from partaking in a simulated alien abduction thanks, but with this condition you can never tell. I believe this was created by two young guys. I received telephone calls many years back, I was only about 19 I think, the last phone call I can remember was when I was 22 yrs. The two guys were from Denmark. That is kinda as far as I have got at this stage Sarah, I’m sorry I am really struggling with my memory. There is no Morgellons Disease, but something very bad happened I know that for sure.